While we were surprised to hear the news we had already as a company decided to no longer support the format. 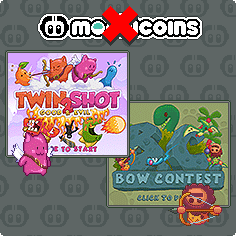 You can see we made no further games using the coins after BC Bow Contest and we had intended to remove the coins altogether from those two games once we had our own login system available. Unfortunately given the short notice period given to us we are not going to be able to transition things as smoothly as we would like but we will do our best to find the best solution in the timeframe for our users. We would like to take this opportunity to thank everyone who supported us by buying the coins in the games we made using them. Along with the coins the login system that was provided by Mochi is also going offline so this will revert saving the game to being only available on a single computer. Mochi have stated that the content people have purchased will still be available to them following that date but that people will not be able to buy new coins or items from that date. We feel at Nitrome that the best solution is going to be to offer that content freely in the game and we will be looking at the two games to decide how to best do that. We will give you more news on that as we have it!